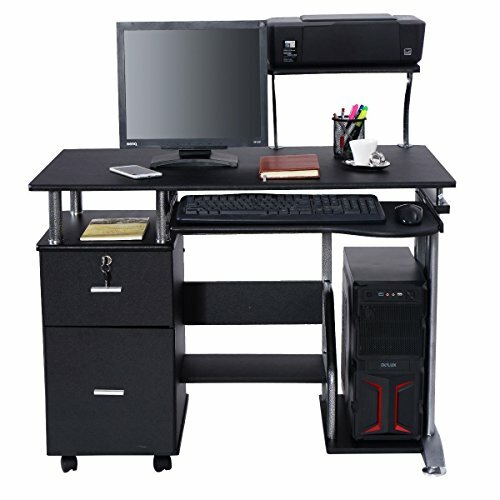 This black computer desk which is exquisitely designed with a smooth slide-out keyboard shelf and two extra drawers is a perfect furniture for home or office, attaching an unmatched convenience to your daily life. with two extra drawers and a separate stand for printers or CPU, this workstation provides an excellent space to spread not only your tasks with laptop but also a privite storage areas for your documents and files. Above the table is another additional stand for your daily office supplies. Practical and ornamental, this amazing computer desk is worthy of high expectation in details of your life.